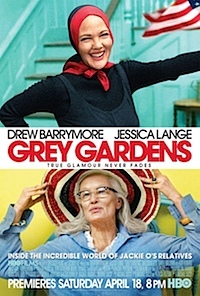 Both the Maysles 1975 documentary and the recently released HBO narrative feature version of Grey Gardens have been criticized for exploiting their subject matter: the loveable, if eccentric, Big Edie and Little Edie Beale of East Hampton. Little Edie's nephew, Bouvier Beale Jr, alludes to these crimes in his recent Town & Country article "The Ghosts of Grey Gardens." "My aunt and grandmother were totally normal people, even exemplary, in the unselfish, loving way they treated people and all God's creatures," he writes. "They didn't know how to say no to anything or anybody and ended up being taken advantage of by hangers-on and others who thought they might gain some advantage thereby." Far from being exploited or taken advantage of, the Beales, I would argue, relish their time in front of the camera. They were true performers at heart, Big Edie explaining she was never happier than when she was singing and Little Edie modeling her quirky fashions between dance recitals. In the HBO adaptation, Drew Barrymore and Jessica Lange expertly capture this artistic spirit so evident in the earlier documentary - so much so we can literally feel their joy when they're on parade. Like vaudeville comedians, they even flaunt their witty banter for the filmmakers. Little Edie says, "You can't have your cake and eat it too in life." Big Edie replies, "Oh, yes, I did. I did. I had my cake, loved it, masticated it, chewed it and had everything I wanted." Little Edie contradicts this philosophy. Delightfully, entertainingly, they continue back and forth correcting one another on this point, but who cares? Big Edie's word choice of "masticated" is so provocative and brilliant we can't get past it! Little Edie: Mother, you don't have enough clothes on. Big Edie: Well, I'm going to get naked in just a minute, so you better watch out. Little Edie: That's what I'm afraid of. Big Edie: Yeah, for what, now why? I haven't got any warts on me. Little Edie: But the movie, the movie! Big Edie: I haven't got any warts on me! Little Edie: That isn't the point, mother darling. What charm and cleverness. We love these women. Big Edie: The cat's going to the bathroom right in back of my portrait. Little Edie: God, isn't that awful? Big Edie: No, I'm glad he is. I'm glad somebody's doing something he wanted to do. Just then, Big Edie looks up in the camera and grins. Perhaps she is explaining something about herself in this ramshackle house as well? Big and Little Edie were eccentrics, gypsy vaudevillians, performers to the core. They lost personal relationships and their home fell into disrepair because all they really cared about was music, dance, singing, the arts - "Did you ever see Gigi with Leslie Caron?" Little Edie asks the Maysles - always already in love with film and stardom. The making of the documentary, the subsequent adaptations of the Broadway musical, this new film on HBO, they don't exploit their subject, they celebrate these women, bizarre and lovely, but, more importantly, these productions fulfill the dreams of the Beales to be featured, to be noticed, to be performers, to be on stage, to be in the movies. Like giant, licking, red flames, they drew the moth Maysles brothers to them - along with generations of filmmakers, performers, fashion designers, and audiences who have been touched, inspired, enchanted by their heart, soul, energy, habits, and preferences. Big Edie and Little Edie had spirits too big to be buried in Grey Gardens. Staunch characters in revolutionary costumes. They needed to be larger than life, doing a little soft shoe, up there, on the mystical silver screen. Exactly where they belong.